A blood pressure test is a simple way of checking if your blood pressure is too high or too low. Blood pressure is the term used to describe the strength with which your blood pushes on the sides of your arteries as it's pumped around your body. High blood pressure (hypertension) can put a strain on your arteries and organs, which can increase your risk of developing serious problems such as heart attacks and strokes. Low blood pressure (hypotension) isn't usually as serious, although it can cause dizziness and fainting in some people. A blood pressure test is the only way to find out if your blood pressure is too high or too low, because most people won't have any obvious symptoms. Having a test is easy and could save your life. When should I get my blood pressure tested? You can ask for a blood pressure test if you're worried about your blood pressure at any point. It's recommended that all adults over 40 years of age have their blood pressure tested at least every five years so any potential problems can be detected early. If you've already been diagnosed with high or low blood pressure, or you're at a particularly high risk of these problems, you may need to have more frequent tests to monitor your blood pressure. A device called a sphygmomanometer will be used to measure your blood pressure. This usually consists of a stethoscope, arm cuff, pump and dial, although automatic devices that use sensors and have a digital display are also commonly used nowadays. It's best to sit down with your back supported and legs uncrossed for the test. You'll usually need to roll up your sleeves or remove any long-sleeved clothing, so the cuff can be placed around your upper arm. Try to relax and avoid talking while the test is carried out. You can usually find out your result straight away, either from the healthcare professional carrying out the test or on the digital display. Blood pressure tests can also be carried out at home using your own digital blood pressure monitor. This can give a better reflection of your blood pressure, as being tested in somewhere like a GP surgery can make you feel anxious and can affect the result. It can also allow you to monitor your condition more easily in the long term. You can buy a variety of low-cost monitors so you can test your blood pressure at home or while you're out and about. It's important to make sure you use equipment that has been properly tested. The British Hypertension Society (BHS) has information about validated blood pressure monitors that are available to buy. In some cases, your doctor may recommend 24-hour or ambulatory blood pressure monitoring (ABPM). This is where your blood pressure is tested automatically around every 30 minutes over a 24-hour period using a cuff attached to a portable device worn on your waist. 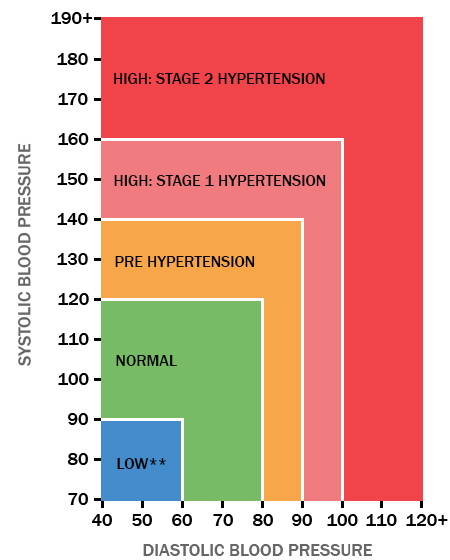 ABPM can help to give a clear picture of how your blood pressure changes over the course of a day. You should continue with your normal daily activities during the test, although you must avoid getting the equipment wet. For example, if your blood pressure is "140 over 90" or 140/90mmHg, it means you have a systolic pressure of 140mmHg and a diastolic pressure of 90mmHg. A blood pressure reading between 120/80mmHg and 140/90mmHg could mean you're at risk of developing high blood pressure if you don't take steps to keep your blood pressure under control. Find out more about what your blood pressure result means. If your blood pressure is found to be too high or too low, your GP or the healthcare professional performing the test can advise you about ways to control it. In some cases, you may be referred to a doctor such as a cardiologist (heart specialist) to discuss treatment options. Read more about treating high blood pressure and treating low blood pressure.